If there is one thing we in the West love, it’s our gadgets. Smartphones, tablets, iPottys – we’ll take ‘em all. And the rest of the world is catching on – in Q3 2013 the global smartphone market grew 38.8 percent, thanks to China’s growing appetite for low-cost Android phones. This is because technology is awesome. Through it we can access information (and each other) like never before in the history of the world. Using a smartphone or tablet, we can FaceTime a friend living on the other side of the country, then text message one living on the other side of the planet (for free) using Viber. Letting our friends, ex’s and high school acquaintances know about the gluten-free burrito we ate for lunch last Tuesday has never been easier. Technology’s awesomeness is the primary focus of the Consumer Electronics Show (CES), an internationally renowned electronics and technology trade show held each January in Las Vegas. Attended by major companies and industry professionals worldwide, it is the place to be if you want to be “in the know” of the latest and greatest in the tech world. But this year, Intel CEO Brian Krzanich reminded us that the cost of producing these technological wonders goes well beyond dollar signs. Always absent from the final price tag of these items are the externalities of shattered human dignity and lost lives. Wait. What? You ask. How does my awesome phone hurt people? Three words: rare earth minerals. Consisting of elements such as copper and even rarer tungsten, neodymium, dysprosium, coltan and terbium, rare earth minerals are what make the magic of technology possible. While China produces 90 percent of the world’s rare earth minerals, a significant concentration exists in the eastern regions of the Democratic Republic of Congo (DRC) near the Rwanda border. For decades, the DRC has been at the center of what some have dubbed “Africa’s World War” which has claimed more than 3 million lives to date. Remember Hotel Rwanda? Much of the violence depicted in the film rages on today, and is funded by the extraction of these rare earth, or “conflict minerals,” according to a report to the United Nations Security Council Committee. Besides fueling an endless cycle of violence, the trade often forces children into the dirty and dangerous work required to ready these elements for export. 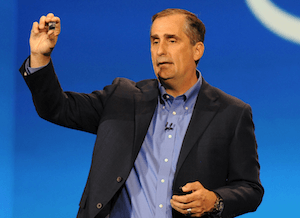 Back to Krzanich – he said Intel had achieved a critical milestone and the minerals used in microprocessor silicon and packages manufactured in Intel's factories are conflict-free as concluded by third-party audits or direct validation by Intel's supply chain organization. Krzanich said Intel has implemented a process within its supply chain to validate that its sources – the smelters that provide tantalum, tin, tungsten and gold used in microprocessor silicon and packages manufactured in Intel factories – are not inadvertently funding the conflict in the DRC. In 2010, the Dodd-Frank Act held provisions aimed at reducing the use of conflict minerals, which spurred Intel and other electronics industry manufacturers to act. Will the rest of the electronics industry follow suit and expunge the sourcing of rare earth minerals from conflict zones? Krzanich has challenged them to do so. But it will be up to consumers to ensure widespread change. Support companies like Intel that factor human rights into their supply chains. “Human Rights” certification labels for consumer tech products should be created to help inform would-be buyers. Technological advancement doesn’t have to come at the cost of our souls, nor does doing so have to come at the cost of profitability. Forward-thinking firms like Intel are proving this. Let’s demand better, because our people and planet deserve better. Based in San Francisco, Mike Hower is a writer, thinker and strategic communicator that revels in driving the conversation at the intersection of sustainability, social entrepreneurship, tech, politics and law. He has cultivated diverse experience working for the United States Congress in Washington, D.C., helping Silicon Valley startups with strategic communications and teaching in South America. Connect with him on LinkedIn or follow him on Twitter (@mikehower).